After a rejuvenating break in Kharaghoda, we decided to make a slight adjustment to our itinerary. 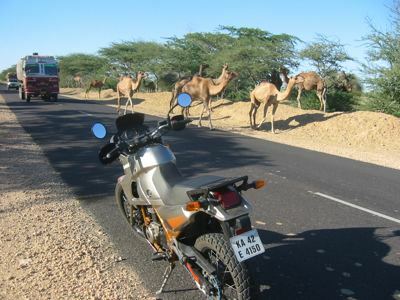 Our original plan was to ride about 350 km to Barmer in Rajasthan state and halt for the night there. We opted to carry on instead to Jaisalmer which is another 160 km. The roads were excellent and having left with pre packed breakfast from Mr. jahangir Vakils’s place in Kharaghoda, we covered a lot of distance before stopping for chai. We got to Barmer by around 2 pm where we had lunch. It’s a very small desert town and we were all glad to have made the decision to carry on. The landscape was changing as we headed more north. Lots of sand dunes with very dry vegetation and the sun was very intense. Lots of wild animals such as peacocks, antelope, langur monkeys were roaming freely close to the highway. Stray dogs are plentiful here. Besides the cows and buffaloes, this is the camel country (see photo). 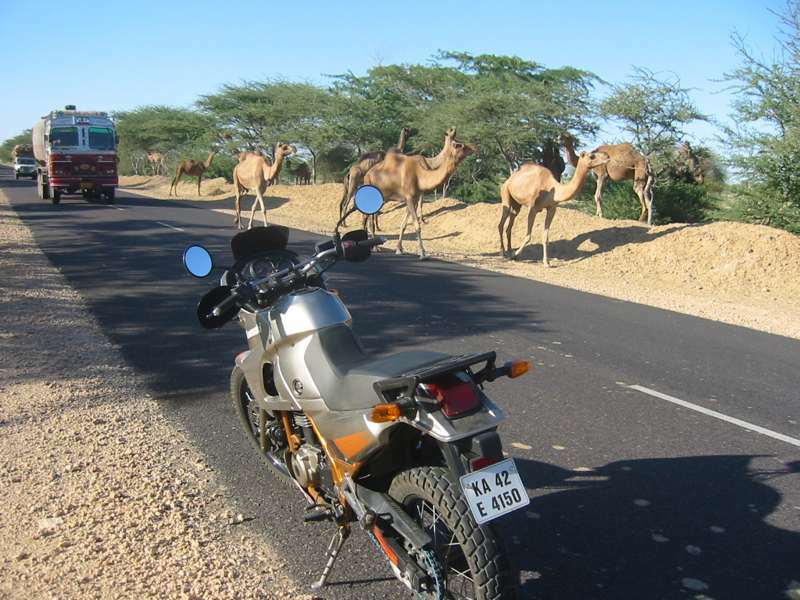 We managed to complete the 520 km ride in 12 hours from when we left, arriving in to Jaisalmer at sun down. It was a beautiful calming sight. 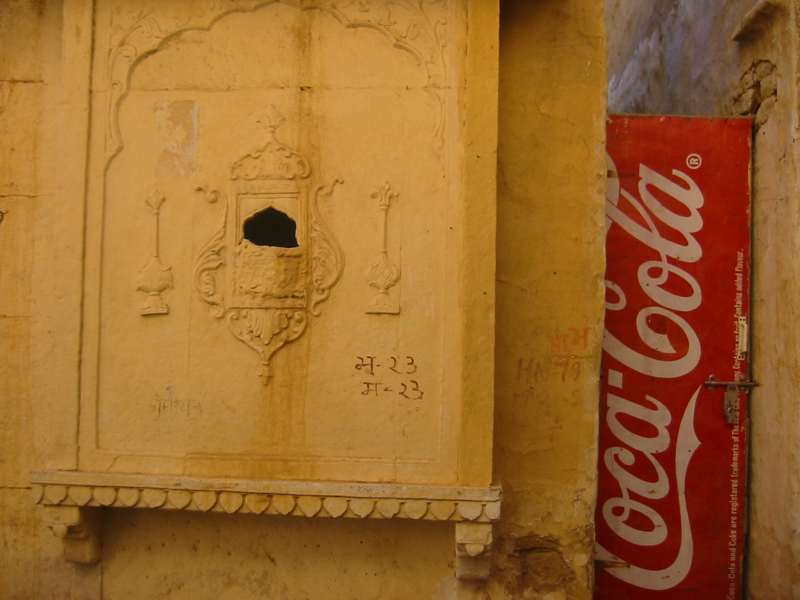 we were booked in to a hotel just outside of the fort city, which was quite comfortable. We were going to be staying here for an extra day, because we made it here a day sooner. Next morning Navroze, Joe and I went and walked inside the 12th century fort. 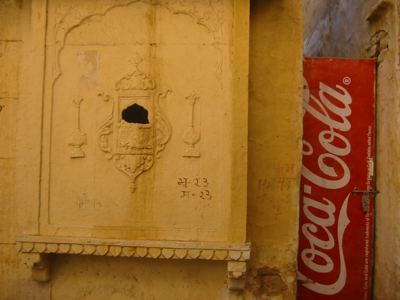 All the previous forts, i have ever visited were meant for the royal family primarily. Here, the entire city is perched on a hill with the fort walls surrounding them. Very compact streets with gorgeous havelis and carved decorative details in stone. Sadly, it’s a hot tourist destination and everything is catered towards that. We walked around for a while, took some pictures (see photos), had some breakfast and were heading back to the hotel as it was already beginning to get hot. We ran into our cameraman, Rakesh who had been in there since 5 am. He was on top of the fort filming a folk singer when he said he felt an earthquake. We hadn’t felt anything. When we got back to the hotel, we checked the news and sure enough, there was a 7.8 earthquake in Northeastern Pakistan and Kashmir felt a 6.8 magnitude shock. This is a concern for us because we are to be in Jammu& Kashmir in 4 days or so. One of the main highways leading to Srinagar is closed temporarily due to landslides. But by the time we get there, we are hoping for road clearance. No worries yet! We are having the assistance of the border security forces (BSF) who when contacted, told us that it would be fine. 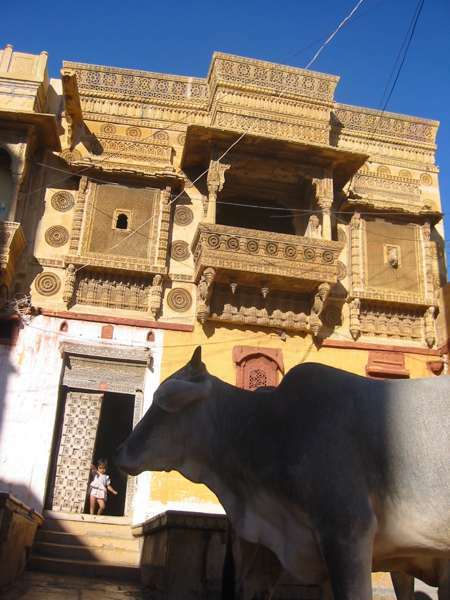 Unfortunately, here in Jaisalmer, there is no Reliance wireless network at all. That is the celphone i use to connect my laptop to the internet. So I cannot post these blogs till we reach our next destination, tomorrow, Bikaner. Posted by Bari on Saturday, October 8th, 2005 at 4:50 am. under Motorbike Diary. The first person that came to mind was you, when we heard of the terrible earthquake. We are glad that you and your friends are safe. It sounds like a true disaster. One of so many that are happening on this planet right now. After a very hot week we have finally had a couple of cooler days here in LA. Kirk is working on a commercial and I am packing to go to Panama in a few weeks. We will continue to follow your trip and wish you the best!!! Has been wonderful following your magical journey through India. Enjoying the fabulous pictures and writings as you make your way. Glad to hear all is well following the tragic earthquake. Will be thinking of you all as you make your way up towards Kashmir. Wishing you a continued safe journey and enjoy!